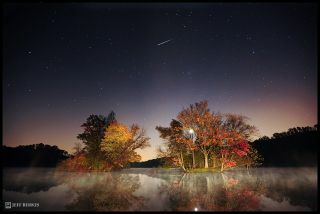 Astrophotographer Jeff Berkes snapped this amazing photo of an Orionid meteor streaking above a lake in Elverson, Pennsylvania, on Oct. 22, 2011, during the peak of the annual Orionid meteor shower. An annual Taurid meteor shower, known by the nickname the "Halloween fireballs" because of its timing, will hit its peak next week before tapering off in mid-November. While some costumed skywatchers try to see the meteor display on Halloween Monday night (Oct. 31), the best time to observe the Taurid meteor shower this year will be Nov. 5, taking into account both their peak of activity and the effect of increasingly bright moonlight on viewing conditions. About 10 to 15 meteors per hour may be visible at around 2:40 a.m. local daylight time, which will be after the bright waxing gibbous moon has set. A clear, dark sky away from city lights is vital to see the Taurid meteors. They often appear yellowish-orange and, as meteors go, appear to move rather slowly. The meteor shower's name comes from the way the display seems to radiate from the constellation Taurus, the Bull, which sits low in the east a couple of hours after sundown and is almost directly overhead by around 2:30 a.m. local time — right around the time that the moon is ready to vanish below the horizon. That means the balance of the night will be dark and very favorable for watching for meteors. Meteors — popularly referred to as "shooting stars" — are generated when debris enters and burns up in Earth's atmosphere. In the case of the Taurids, they are attributed to debris left behind by the comet Encke — or perhaps by a much larger comet that upon disintegrating, left Encke and a lot of other rubble in its wake. Indeed, the Taurid debris stream contains noticeably larger fragments than those shed by other comets, which is why in certain years this rather elderly meteor stream occasionally delivers a few unusually bright meteors known as "fireballs." Looking eastward on a pleasant October evening, you can spot a variety of deep sky treats. The Taurids are actually divided into the Northern Taurids and the Southern Taurids. This is an example of what happens to a meteor stream when it grows old. Even at the beginning, the particles could not have been moving in exactly the same orbit as their parent comet; their slight divergence accumulates with time. At the same time, the sun is not the only body gravitationally controlling the particles' orbits. The planets are having subtle effects on the stream. Since the positions of the planets are constantly changing, the particles pass nearer to them on some revolutions than others, which diverts parts of the stream, fanning it out and splitting it. So what was originally one stream diffuses into a cloud of minor streams and isolated particles in individual orbits, crossing Earth's orbit at yet more widely scattered times of the year and coming from more scattered directions until they are entirely stirred into the general haze of dust in the solar system. Victor Clube, an English astrophysicist and is an expert on comets and cosmology, indicated back in 1992 that the Taurid meteor stream contains perhaps a half a dozen full-size asteroids whose orbits place them squarely in the stream. Clube and his colleagues argue that the Taurids' range of orbits indicates they were all shed by a huge comet, originally 100 miles (161 kilometers) across or more, that entered the inner solar system some 20,000 years ago. Encke's has the shortest known orbital period for a comet, taking only 3.3 years to make one complete trip around the sun. Meteor expert David Asher has also discovered that the Earth can periodically encounter swarms of larger particles in certain years. Maximum rates for the southern branch occur near November 5th and the northern branch peaks near November 12th. This year the moon is favorable during the first week of November but the northern Taurids peak only two days after the full moon. The two radiants lie just south of the famous Pleiades Star Cluster. So during the next couple of weeks, if you see a bright, slightly tinted orange meteor sliding rather lazily away from that famous little smudge of stars, you can feel sure it is a Taurid. Editor's note: If you snap a great photo of the Taurid meteor shower or any other astronomical sight, and would like to share them with SPACE.com for possible stories or a gallery, contact managing editor Tariq Malik at: tmalik@space.com.